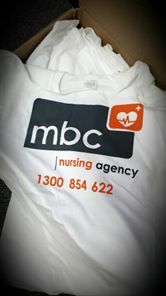 The MBC Nursing Agency team is all set for the upcoming Memory Walk / Jog with 12 Team members participating; 7 Team members jogging the 7.5km run and 5 walking the 2km walk to raise money for Dementia and Alzheimer’s Australia!! Thank you very much to all our supporters donating to this cause and team members for being the best team ever! !